In the closing scenes of Angels in America: Perestroika, Roy Cohn rages that he is “the heart of modern conservatism.” It’s a chilling observation. Cohn as a young prosecutor pushed, unethically, for the death of Ethel Rosenberg and was chief counsel of Joe McCarthy’s HUA team. As a character in Berkeley Rep’s seven-and-a-half-hour revival of Kushner’s award-winning play, he is portrayed as crass, manipulative and despicably unethical; in the real world, his imprint can be seen in behavior and ethics of the man he mentored, Donald Trump. Unflinchingly and irredeemably contradictory, Cohn died of AIDS while at the same time denying that he was homosexual. Ultimately, Cohn was disbarred by the New York Supreme Court for “dishonesty, fraud, deceit and misrepresentation.” He died in hospital some two months later. 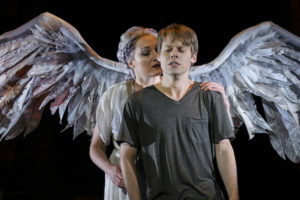 Francesca Faridany (The Angel) and Randy Harrison (Prior Walter) in Berkeley Repertory Theatre’s production of “Angels in America”. Photo courtesy of Kevin Berne/Berkeley Repertory Theatre. One of the problems of living in the Bay Area, as well as being a major plus, is that we live in an area that has greater tolerance than most, even though tolerance and acceptance for many communities is quite a bit less than total. Berkeley Rep’s revival of Tony Kuschner’s Angels in America brought that into full focus. The play is a clear reminder of what it means when homophobia is the norm, as it was in the mid-1980s when the AIDS epidemic was its most savage, most terrifying and least understood. Outside the bubble of our community, homophobia remains prevalent, and our current government is working to undo the hard-won progress made in LBGT rights over the past decades. The play confirms that a homophobic world – ungenerous, fearful and callous – is not one to reinstate. The play follows the lives of three central characters whose sexuality endangers them, physically, emotionally and ethically. There is Cohn (played by Stephen Spinella, who acted the role of Prior Walter for five years on Broadway, garnering two Tony Awards). And there is Joseph Pitt (Danny Binstock), a young Republican lawyer, who like Cohn denies his sexuality but takes the alternative path of marrying and closeting his desires. Finally and most central is Prior Walter (Randy Harrison), a beautiful young drag queen infected with the mysterious disease that is killing gay men unrelentingly. Both men have partners: Harper Pitt (Bethany Jillard), who unable to understand her husband’s sexual indifference, takes Valium so frequently she is living in a hallucinatory state, and Louis Ironson (Benjamin Ismail), who realizing his lover has contracted a fatal disease abandons him. It all sounds – is – heartrendingly tragic. But the play is driven by comedy, an ironic and outrageous comedy that disrupts the play’s inherent pain and undercuts any possibility of sentimentality. Several characters become matrices of humor: Belize (Caldwell Tidicue), the ex-ex-drag queen turned nurse and various cameo roles, most played by Carmen Roman and Francesca Faridany. Into the tragic-comic mix Kushner adds fantasy. Harper’s drug-fueled visions and Prior’s disease-ridden brain carom back and forth between the bizarrely surreal and the everyday absurdities of life. At times, it’s hard to tell where the “real” story ends and the hallucinogenic begins. The resulting complexity lifts the play from the morass of despair and futility, which were characteristic of the fear that entwined the epidemic in its early stages. It is this fantastic spin that gives the story a mythic and transcendent quality. Its vision is greater than reality and demands to be staged monumentally. Berkeley Rep’s production does that. Takeshi Kata’s scenic design moves seamlessly and quickly through many locales and states of mind, and is enhanced by Alexander Nichol’s projection design and Jennifer Schriever’s lighting. Costumes were by Montana Blanco. Stunningly, angels fly; their flight paths and wings choreographed by Flying by Foy. The venue provides two ways of seeing this two-part drama: either on separate nights or in the one day marathon, with Part One at 1pm, and Part Two at 7. Angels in America continues through July 22. For tickets and information, visit act-sf.org.